For the past 18 hours, people having been freaking out because details the Federal Communications Commission’s (FCC) latest net neutrality proposal leaked online. The proposal would basically create two lanes of traffic on the internet. One lane–the average speed lane–would be guaranteed, but a faster lane would also be allowed and businesses could pay extra to be included in it. If this proposal were to pass, the type of deal that Comcast and Netflix entered into would be perfectly acceptable, as long as Comcast wasn’t limiting speeds to the point that people were not even in the average lane. Since the details leaked, advocated of net neutrality–who have a very specific idea of what they would like the law to be–were angry with the FCC. The media also jumped on the bandwagon and began to say things that suggested the new laws would completely abolish any sort of Open Internet or net neutrality. However, the proposal doesn’t actually seem to be all doom-and-gloom and to back that up, FCC Chairman Tom Wheeler released a statement in response to the claims that have been made about the leaked details. From what we know so far, the new set of rules is definitely flawed and if we lived in a perfect world, all traffic on the internet would be treated equally. However, given the massive amount of lobbying that the internet service providers (ISP) are engaged in, it simply wouldn’t be possible for a policy like that to be implemented right now. 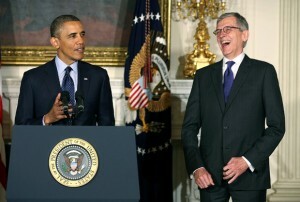 So, we are in a situation where compromises must be made and the FCC’s new rules seem to be relatively fair. They will not allow traffic to be discriminated against in an antic-competitive way and based upon Wheeler’s statement, we should not end up in a situation where startups are at a disadvantage simply because they cannot pay the ISPs extra. However, we won’t know what the FCC is planning to do until the actual proposal is made public. Summary: FCC Chairman Tom Wheeler is defending the FCC’s latest set of laws. The proposal would allow for two lanes of internet traffic and companies can pay more to be in the faster one.